If you wanted to use the compression proxy that Google introduced in mobile versions of Chrome some time ago on the desktop, you had to use a third-party extension until now to do so. The extension enabled the compression proxy on desktop versions of Chrome so that you could use it to speed up your Internet browsing by redirecting it through Google servers. The system compresses data, images and textual contents for example before they are sent to the browser which speeds up the loading time of websites thanks to the reduced size of the data. The concept itself is not entirely new though as Opera Software has been using Opera Turbo in its desktop browser and mobile clients for years. Today, Google released Data Saver to the Chrome Web Store. 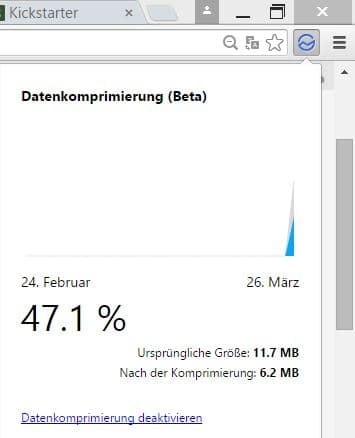 It implements the data compression technology for desktop Chrome in similar fashion as the third-party extension Data Compression Proxy does. Note: Google labels the extension beta currently. While that is the case, I did not notice any issues while using it. Having said that, I only had the chance to test the extension for a short period of time. Google notes on this help page that users may experience issues when Data Saver is enabled. This includes issues locating the user, image fuzziness or internal sites that may not load properly because of it. Data Saver adds a button to Chrome's address bar that you can click on to display information about the compression. The proxy is enabled by default which means that all connections that you make from that moment on use it except for two. Chrome won't use the proxy for HTTPS connections or websites opened in the browser's Incognito Mode (private browsing). The interface of the extension displays a graph highlighting the saved bandwidth over time. There you also find listed how effective the compression technology was in reducing the transferred data size, and an option to turn the feature off. The official extension has no whitelist currently unlike the third-party extension Data Compression Proxy. A whitelist can be useful as it allows you to block the proxy from running on specific sites, for instance on sites where its use causes issues on. Since both use the same technology, you should not see much of a difference when comparing their effectiveness. Google's extension is less flexible than the third-party extension. While that may not be a problem for all users, as you can disable the compression if you need to access sites were it causes issues on, a whitelist is certainly the comfortable solution. Still, there is a chance that Google will introduce this option in a future update. As far as gains are concerned, they can be huge depending on what you do on the Internet. While you won't see a difference when watching videos, you may experience faster loading times on many websites thanks to the compression technology used. Privacy is a concern obviously as you route most of your traffic through Google servers with the proxy enabled. This seems like a security concern for me. Google now gets to read all your packet data? Yep that is the downside, all regular traffic goes through Google servers. Why not using ZENMATE then? They offer “data compression” and security. Well, not exactly, this is port 80 HTTP traffic you have the option to opt-in to be routed and optimized through Google’s system, if you try to access anything over HTTPS it does not intercept your data. Worth noting that Google has made a strong effort to push sites onto HTTPS. Also, Google makes what this proxy rig does, which is essentially to apply mod_pagespeed best-practices tricks on the fly, available to site operators for free, and open source, with the mod_pagespeed module which can be used with Apache, NGINX, IIS (though closed source) and I think Apache Traffic Server. I’m trying to suggest Google has a genuine interest in speeding up the web for everyone, and not just to sniff for data. Regarding privacy from Google of your HTTPS traffic, website operators can sign up with Google’s Pagespeed Service in order to serve their site using Google as a CDN that applies these tricks to your data. In that case, operators of sites with HTTPS that want that traffic handled and modified by Google do have to surrender their keys, thereby raising privacy concerns, I suppose. Privacy issues aside, this is quite an undertaking from an engineering standpoint, slowly positioning themselves to be a magical proxy server of the whole Internet. They pulled it off with phones and now it’s time to test the desktop waters. Make the web faster. Google’s pretty good at that. Another thing, won’t HTTP 2 sort of eradicate the need for this? 1- Data Compression Proxy better or Data Saver ? 2- Can be used both together plugin ? Well, Data Compression Proxy is not an official Google extension. I’d stick with Google’s official extension. not an official Google extension? !